JULIA SPENCER-FLEMING: Last year, my dear friend and next door neighbor (Hi, Roxanne!) decided to up stakes after seventeen years in Maine and return to her native Colorado, based on some totally bogus "reason" like being closer to her grandchildren and aging parents, as opposed to me, her friend, ha. Anyway, it turned out it was not a good time to put an 1837 house in an historic district on the market. Months ticked by, no one made a credible bid, and so Roxanne and her husband made a fateful decision that directly resulted in my delicious dinner last night: they rented their house. To a foursome of young farmers looking for a place to live with arable land attached. Which is how our neighborhood got a farm, over a century after the last commercial agriculture happened here. 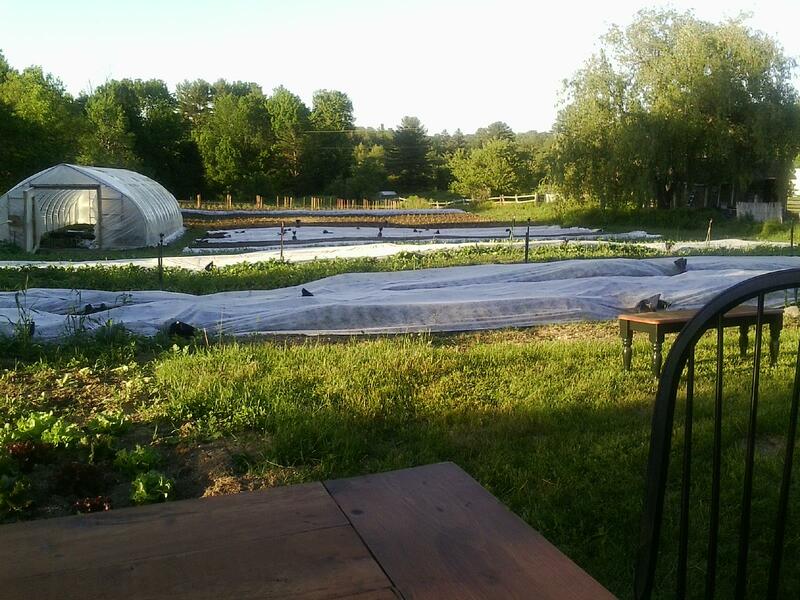 New farms or revived old ones have been cropping up in Maine these past few years. I've seen it in upstate New York, too, decades after giant agribusiness drove scores of small family farms out of business. The desire of consumers to eat locally-sourced and organic foods, to have a wider array of meats, vegetables and alcohol than show up in the typical supermarket, has made previously unsupportable plots of land potentially profitable. 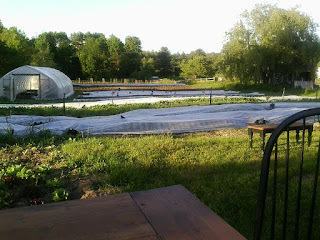 Which brings us to our new neighbors, Bumbleroot Organic Farm. 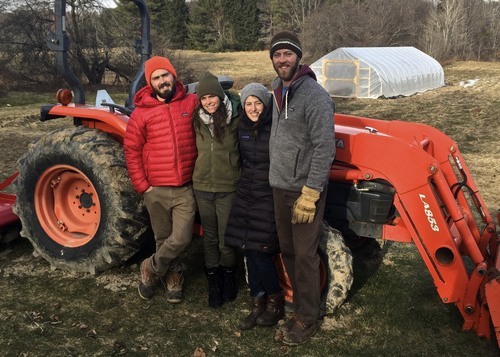 The kids (as Ross and I call them, because we are SO OLD) came in with a plan for a viable business using three acres of land, which sounded unbelievable to me until I actually saw it planted. They lease a little less than an acre from us (I've had to tell Ross no, they aren't tenant farmers and he is not now Lord of the Manse) the same from the folks on the other side of them, and the rest from Roxanne's formerly unused back field. Folks, I have never seen a farm so Instagrammable in my life. 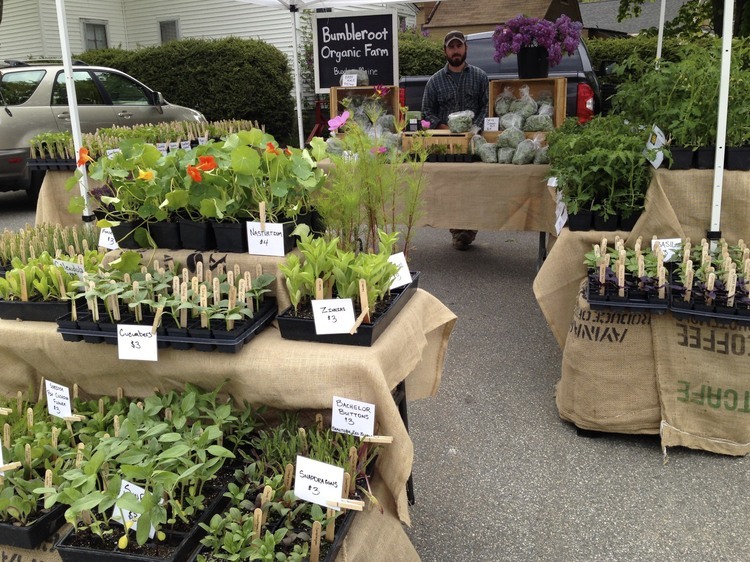 The young farmers are cute, the growing plants in their orderly rows are lovely, the tiny farm stand at end of their drive is marked by a chalk sign and everything seems to be continually bathed in soft Maine sunshine that's like God's Own Filter. And OMG the produce. I've long been interested in trying a CSA (Community Supported Agriculture) share, but most of the area farms and fishermen distribute theirs in Portland, which is less-than convenient for me. Plus, I'm cheap, and balancing my desire for fresh and organic against the undeniably higher cost usually resulted in me going for the lower priced carrots. But I have to tell you, after receiving the first two of our CSA boxes, I am sold and will never go back. First, the stuff really tastes better. Not to dis all the hardworking folks out picking lettuce in California, but the greens we've been eating (this early in Maine's season, our share is mostly leafy greens) are so...flavorful. It's like the difference between eating fish sticks and fresh fish. In other words, having a CSA share is fantastic, and I plan to get one next year, and the year after that, providing the kids farmers do well. Bumbleroot is off to a great start - along with the farmstand, they are selling at the Kittery Community Market and the Saco Farmers Market. They're sourcing for a cool new restaurant, MK Kitchen, in Gorham and best of all, they sold out their entire offering of CSA shares before the first veggies came out of the ground. The moral of the story is: support local farming. The food is demonstrably tastier (and of great variety) than the boring selection in the supermarket, the farming methods are healthier for the environment, and - as I can personally attest - community life is enriched by having small farms as part of the mix. How lucky you are to have the farm neighbors . . . farm-fresh simply can't be beat . . . enjoy! Watching this "farm to table" movement happening gladdens my heart. And you're actually able to watch and enjoy practically from your own back yard - cool! Yes, yes, yes! 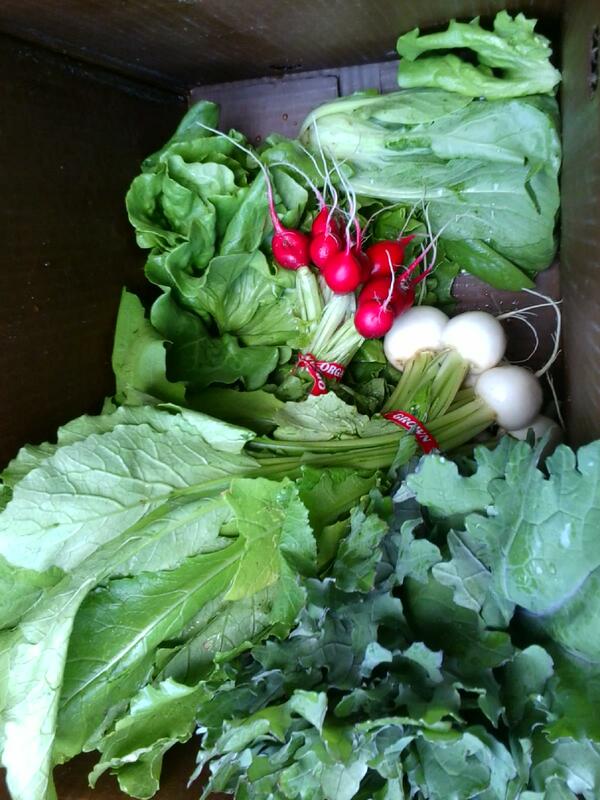 We have a CSA share with Green Spark Farm in Cape Elizabeth and it is a wonderful thing. I met Austin, one of the owners, probably eight years ago when he worked at the coffee shop across from my office. One day he mentioned that he was really a farmer, just doing the barista gig until he and his wife (who both studied agriculture in college) could find some land. Fast forward a few years and they have a very successful, amazing farm and one-year-old twin daughters who I'm sure will be out weeding the carrots before long. My own nephew and his wife are farming in Central Massachusetts, raising pigs, chickens and sheep. I love eating the eggs my four year old grandniece collected as part of her morning chores. You are right, Julia, it is more pleasurable to eat food when you know its source. I'm willing to pay more for the taste, the variety, and the low carbon footprint. And I love supporting the young farmers, who work so hard and yet always seem to be smiling. Another generation of back to the landers is thriving here in Maine. They are thriving wherever they can get their foot on the ground! Ohio State University was one of those land grant colleges, with an Ag department,cranking out those County Extension sheets on when to prune your apple trees, etc. It didn't seem relevant, somehow, in the 80s and 90s. But, now? Ohio is full of the same small-scale, family-run farms that you are talking about, Julia and Brenda. It's great to support them and see them continue to grow in numbers. What a great story! Thanks for sharing it, Julia. We get our 'local' produce from our farmer's market. For a few years we belonged to a CSA but honestly there was just too much kale. I don't mind kale, but a little goes a long way in my house. This is so totally cool! You are incredibly lucky to have this happening next door to you--and long may it continue. We have a garden in the summer, which we both dearly love. And I go to our local farmers' market every Friday. It's been harder to find great veggies in Key West, though this year they also started a FM and it's going great guns. Hurray for people catching on to local fresh food!! Julia, I love this! We've been doing a CSA for a couple of years now. My daughter and I share a share :-) And in the winter she gets the lion's share (couldn't help it) of the kale. Ours is every other week and the pick up point is literally a block from my house. And you're right--the vegetable don't taste anything like long-transit, refrigerated produce. 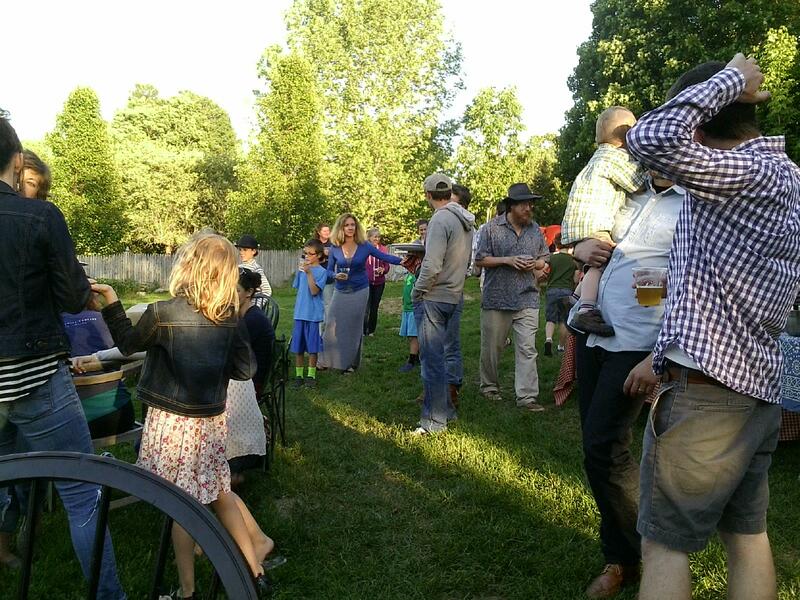 We got several varieties of just-picked yellow squash last Saturday, sliced it up and threw it on the grill at my birthday party. It was the best thing on the menu. Did you know yellow squash could actually taste like something? I've never done a CSA, but this reminds me that I really need to visit the local farmer's market this summer. How utterly marvelous. Lucky you! I am constantly amazed by the grit of Maine farmers. Going back hundreds of years, digging that hard, rocky soil to make a living. So impressive. Now you can come up to the Ellsworth area to Seal Cove Goat farm and get some of their amazing cheeses to go with your veggies. Last summer they had a handmade wood oven in which they made pizza from stuff they grew there, plus their cheese. Fabulous! When I joined a CSA, I was shocked at the taste difference in the vegetables. I couldn't believe my own taste buds, how much more flavorful every piece tasted. Yes, at times I've been challenged with the volume of kale (what is it with kale that EVERY CSA provides vast quantities??) but the taste is so worth the challenge! Growing up we did not have a garden, but we had veg farms with in walking distance that had stands or on Daddy's way home from work. Enjoy all your fresh veg and fruit. Lucy? I'm thinking this has Haley Snow written all over it! How wonderful to have the farm next door! We go across town to pick up our CSA share, and yes, mostly greens right now - lots of salads on the menu! 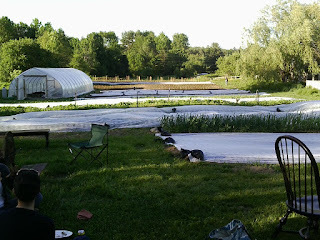 This is our fifth year and third farm. We found the first one boring after 3 years (kale and swiss chard in every bag! ); the second one ran on a "first come, first served" system that we didn't care for because they kept running out; this third one seems to be good so far. We have also gotten some green garlic, radishes, and each week's share includes a beautiful bouquet of flowers - pink and white peonies this week! 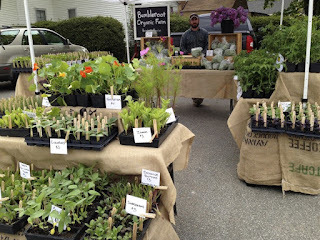 We also are very lucky here in seacoast NH to have Farmers' Markets just about every day of the week, including a Sunday market here in beautiful Nottingham. Trudi G, I am envious of the flowers! Julia, we do get lots of kale, sometimes three different varieties, over the winter. Maybe partly popularity, but more because it's easy to grow, I think. My daughter put in smoothies. And noodle and broth bowls, which so far I've found is my favorite way to eat greens. How fantastic for all involved!! As an aging hippie I love stories like this. Here in the Santa Cruz Mountains of Northern California CSAs abound, and farmer’s markets are plentiful in the Santa Clara Valley, so it’s very easy for us to get organic produce. We’ve been doing just that for decades. You might want to beware though. I read a comment on FB today that said, “Organic food causes all sorts of cancer, and GMOs haven’t been proved to be harmful at all.” Uh-huh. I’ll stick with the flavorful, scrumptious organics and let that knucklehead use his body as a test site. So fabulous ! You are lady of the manor! Rushing in late but this is wonderful ..